Getting dentures is hardly anyone’s favorite decision. For some, getting dentures is admitting defeat to peer pressure. But the real reason why one should get dentures is neither because of their cosmetic backdrop, nor the confidence they exude – you need dentures to help you chew food properly. A lot of people aren’t born with the perfect smile. Brittle teeth, impacted teeth, and missing teeth – these are just some of the reasons why people want to get dentures. Getting dentures is a lifelong decision, and a convoluted one as well, since you’re bound to take care of false teeth due to the cost of having them replaced. A few young people have often thought of getting dentures as replacement for their crooked teeth. Apparently, this doesn’t solve all long-term problems with the teeth. If the tooth is not causing you any pain at all, and you just wish to have false teeth in place of it, consider getting veneers or wearing braces instead. 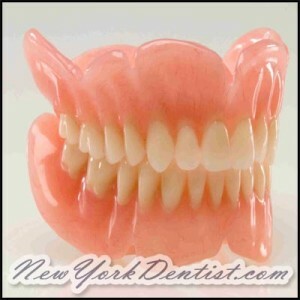 Dentures are the last resort for any cosmetic malady. In fact, they cause even more problems if you have your good teeth pulled out just for the sake of getting full dentures. You’ll have to hold the upper and lower dentures from falling out using your tongue. False teeth will also impediment your usual routine of smiling and laughing, as there is a tendency for the false teeth to fall out with minor ecstatic movements. Dentures will also deform the bone and tissue in your mouth. The brain – which is now aware that all the teeth have been extracted – will cause the alveolar bone and tissue that once supported the teeth, to reabsorb or to die off, thus leaving you with a deformity not only in your jaw, but also in some parts of your skull, as collateral damage. Your chin will then start protrude, followed by the retraction of the alveolar bone, thereby giving you a “squished face”, even if have your dentures on. Dentures DO NOT last a lifetime. In fact, the only useful duration of any set of false teeth is only 7 years. After that, you’ll have to go visit your dentist again and get X-rays for any change in the anatomy of your bite, not to mention the “extra spacing” gums have formed while wearing dentures. You will also have to visit the dentist every 2 years to fill spaces caused by the recession of the alveolar bone, or else your facial structure will continue to deform, making your face appear smaller, and your teeth bigger. If you fear any of this happening to you, there are also a cost-efficient alternative called dental implants. They work just as good as any natural set of teeth, but without the fear of facial or oral deformity caused by dentures. Dentists agree that while dental implants can set you back a few thousand dollars, they will be the ultimate solution for people who want unrestrained comfort for the rest of their lives. Unless you’re absolutely serious about getting dentures, whether partial or complete, you should consult a dentist who specializes on replacement teeth –a prosthodontist.